Coverage: Ball-by-ball Test Match Special commentaries on BBC Radio 5 live sports extra, Radio 4 LW, online, tablets, mobiles and BBC Sport app. Live text commentaries on the BBC Sport website. 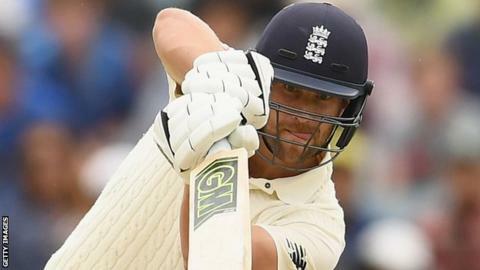 Batsman Dawid Malan has been added to the England one-day squad for the series in Australia, as all-rounder Ben Stokes will not fly out with the group. Stokes, 26, was arrested in September on suspicion of actual bodily harm after an incident outside a nightclub. Although named in the Ashes and ODI squads, he was told he would not be selected until the issue was resolved. As he continues to await any possible Crown Prosecution Service charges, he may miss the entire tour. England surrendered the Ashes series after losing the first three matches before drawing the fourth. That series concludes in Sydney on 8 January and, after one warm-up match on 11 January, the first of the five one-day internationals takes place in Melbourne on 14 January. Malan, 30, is yet to play a 50-over match for England. He made his international debut in a Twenty20 match against South Africa in June, prior to his first Test appearance the following month. The Middlesex batsman hit England's first century of the Ashes series in Perth and has scored 316 runs in seven innings. Stokes flew to New Zealand, the country of his birth, in November and played three one-day games and three T20s for Canterbury, having been granted a no-objection certificate by the England and Wales Cricket Board. He returned to the UK to spend Christmas with his family and has now been given permission by the England and Wales Cricket Board to take part in the Indian Premier League.